Hand Wrapping isn’t for cushioning the hands. That’s the role of a glove or hand protective equipment. Wrapping’s role is one of support – to secure loose joints and moveable bones to limit possible injury, particularly of the knuckles, long bones along the back of the hand, and other small bones, especially in the wrist. Wrapping helps distribute the shock of impact across the entire hand and wrist. This also helps limit strains or tears of the ligaments that connect the bones of the hand. Skin too is protected from bruising or tearing. The fact that your wrap doesn’t mean you can’t break bones or injure your hand upon impact. It only minimizes the possibility. Correct bone alignment is important and if you hit incorrectly, chances increase that your hand will suffer as much as your opponent when they connect. Below you will see a video of the method taught by my boxing trainer “Gato” Figueroa (featured numerous times onESPN2 and HBO fights and formerly ranked 4th in the world as Light Welterweight). He is a great technician. 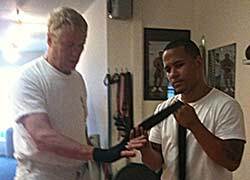 Christopher Caile having his hands wrapped by his boxing trainer “Gato” Figueroa before a training session. There are other methods too, but some are better than others. I particularly like this method because the wrap not only supports the wrist, thumb and the long bones along the back of the hand (metatarsals), but it doubly supports the knuckles by wrapping around them as a unit and between them too. I am using 180 inch elastic wraps which are preferred for medium to large hands. For small hand 120 inch versions are sufficient. They can be purhased from most sports, martial arts or boxing supply outlets. While Gato wraps my left hand I had a fellow boxer hold my iPhone for this video. It’s not perfect, but you can follow the wrapping method. You might also hear music in the background. It’s was playing at the time we took the video in the Morris Park Boxing Gym where I train (in the Bronx, NY). Wrap snuggly but not too tight. You want to provide support but not cut off circulation. Turn your hand so your palm faces down. Keep your fingers open. Place the loop at the end of the wrap over your thumb. Be sure that the lapel on the wrap faces down toward the back of your hand. Hand Wrap 2 from FightingArts on Vimeo. When your hand wrap is complete close your fist. The stretchy cloth of the wrap will tighten, binding, supporting and cushioning parts of your hand and wrist into a solid unit. You may find that you make adjustments or even wrap slightly differently each time. But over time your wrapping should stabilize into a predictable pattern. Just remember that the areas you need to stabilize are the knuckles, the long bones along the back of the hand, the thumb and wrist. Very great post. I just stumbled upon your blog and wished to say that I have truly enjoyed browsing your blog posts. After all I’ll be subscribing to your rss feed and I’m hoping you write again very soon! I sometimes wrap my hands for training, sometimes not. When I don’t it has to do with training myself to punch properly with or without a wrap. Good tutorial, thanks! You are welcome. Thank you for your valuable comment. I will check you blog also.